Canadian Wapiti, hind calls her high-pitched bark at forest edge - medium shot. Banff National Park, Canada. 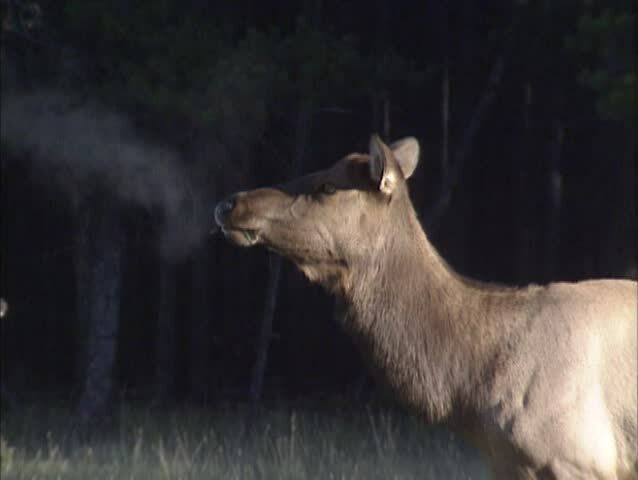 The elk, or wapiti (Cervus canadensis), is one of the largest deer species in the world. hd00:06Coyote digging in animal burrow, hoping to eat the occupant. Coyote (Canis latrans) is a wild canine of North and Central America. It is adapted to both Wild and Metropolitan areas. hd00:10Horse - Brown Grulla - Lying Loop - Realistic 3D animation with alpha channel isolated on transparent background for your equestrian naturalistic and fantasy projects. hd00:10Laying Horse - Bay Brown - Alpha Channel - Thoroughbred equine resting sleeping, or dreaming on ground. Realistic 3D animation with transparent background.